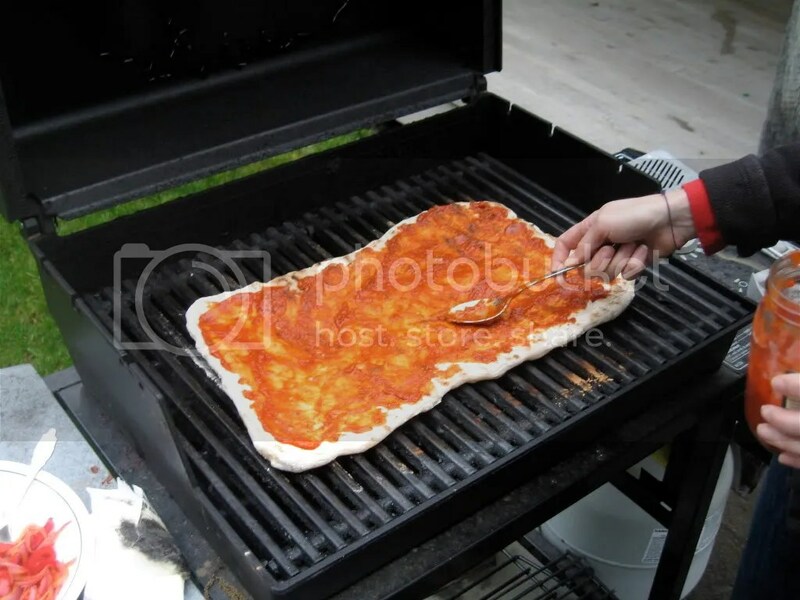 When a friend explained to me how grilled pizza worked, I tried it but wasn’t expecting much. Several years and many pizzas later, we are addicts. When you have crunched into the crisp, slightly chewy crust and tasted the soft, melted mozzarella, there is no return. Had you visited my home this past winter, you would have seen boots near the back door and a grill still sitting on our snowy patio. And on those nights when the craving hit, out I went (to the delight of the children), armed with boots and tongs. I’d brush the snow off the grill, turn on the heat, and make our fix. 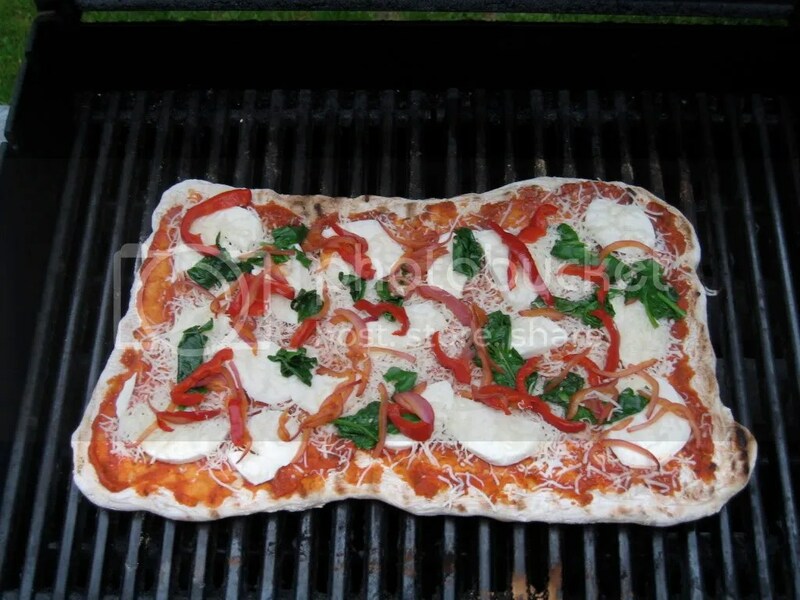 So spring is here, and even though we are once again grilling hamburgers and hot dogs, the pizza reigns supreme. Preheat your grill to about 500°F. Sprinkle a sheet pan with flour, and turn out your dough. 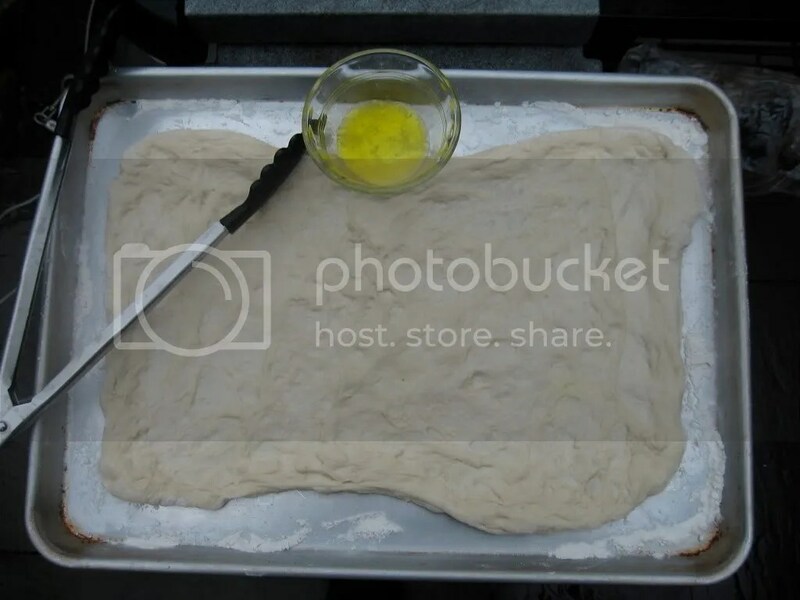 Stretch gently (the dough stretches best when close to room temperature) into a large rectangle. Let dough rest while you assemble all other ingredients on a tray. 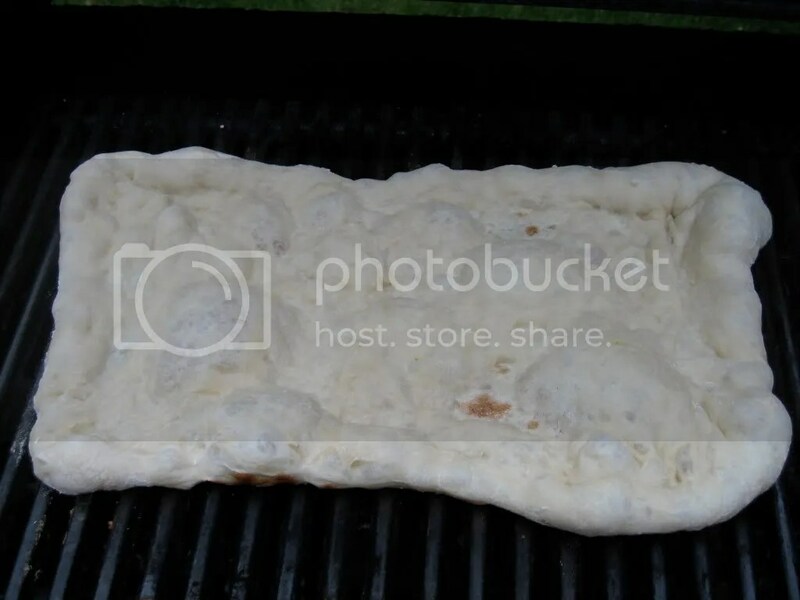 Take your sheet pan with the dough on it, some olive oil, and tongs out to the grill. Use a wadded paper towel or a basting brush to dip into the olive oil and spread quickly on the grill grate. 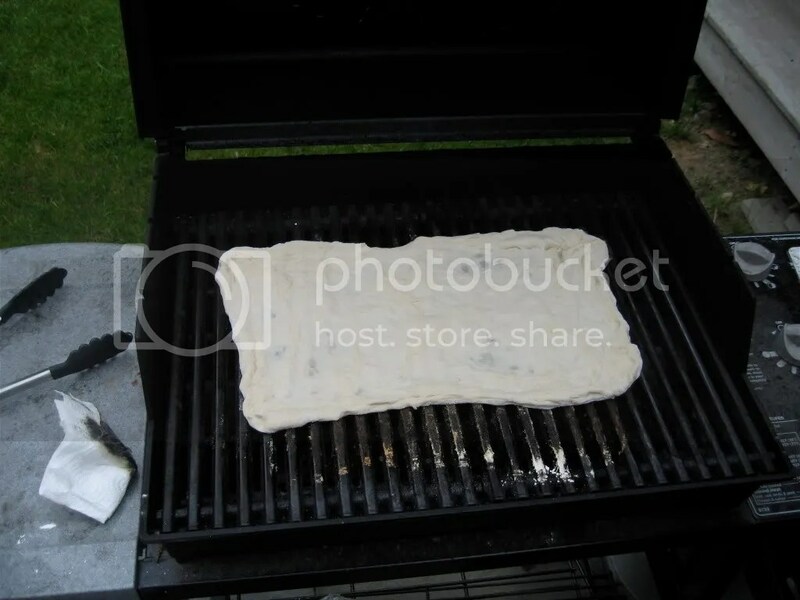 Gently transfer the dough onto the hot grill and restretch into rectangle. Close the grill and TURN DOWN THE HEAT to medium-low. Cook a few minutes, until the dough looks bubbly. Meanwhile, bring out your tray of toppings (I used sauteed red onions and peppers with arugula and spinach). Flip with tongs. Spread sauce and add the cheese and toppings. Close the grill. Cook for another 3-5 minutes or until cheese is melted. So, you’ve still NEVER made grilled pizza for me, hint hint. Lee, I am so very much enjoying your site! Very inspiring! I love the photos, quips, and oh yeah…useful recipes. Thank you! Thanks for dropping by to say hi! That pizza looks amazing. I’ve always wanted to make grilled pizza! I’ve been holding out until we get a large grill, but I might break down and do it on my grill pan. Have you tried it that way? I haven’t tried the grill pan. It may take longer for the cheese to melt because there’s no cover, but maybe you could tent some foil over it. I have made it on a charcoal grill, and that tastes delicious, with a more smoky flavor. Thanks for your great recipes on your blog! 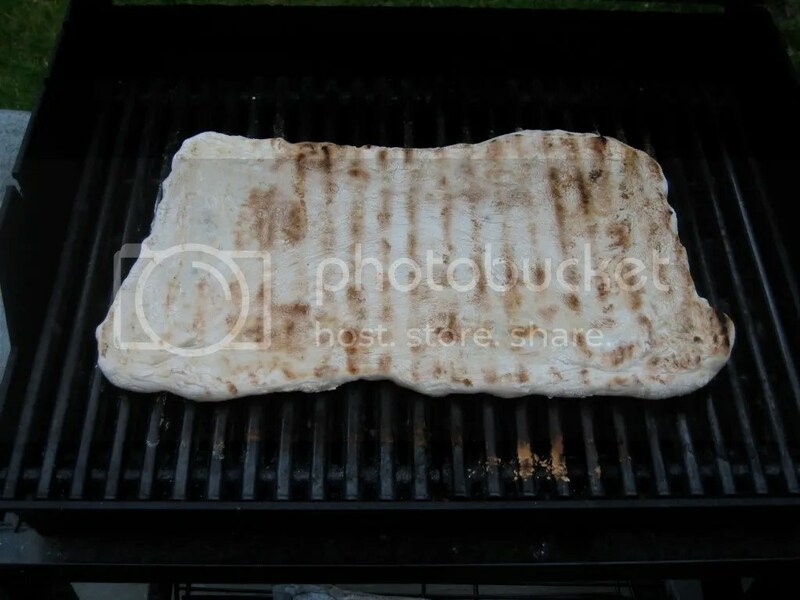 Has anyone ever tried this with a charcoal grill? I’d be very interested in trying this, but we only have a charcoal grill. It does work with a charcoal grill. Get grill very hot, have all ingredients ready, and stay close the whole time. Also, it helps if the dough is thin because it cooks more quickly on the charcoal grill. Delicious flavor, though! Let me know your results. 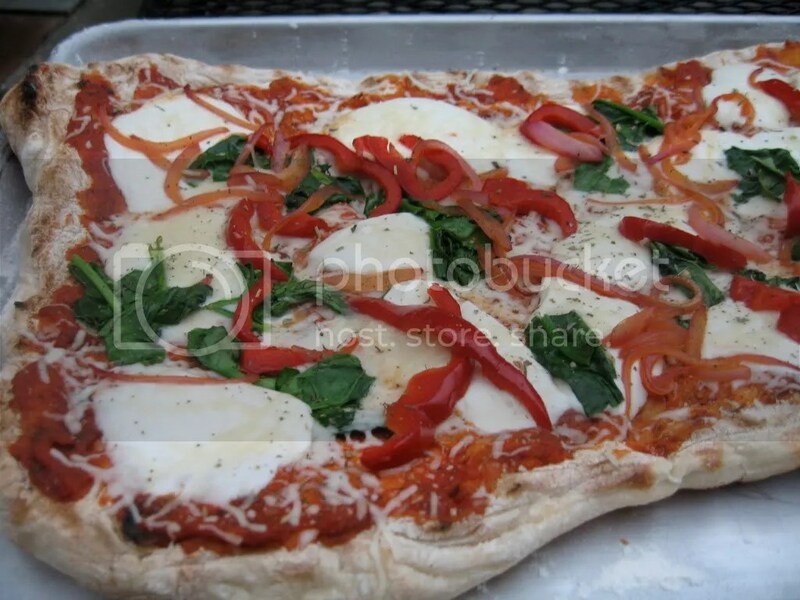 After grilling pizza, you won’t want to go back to your local pizzeria. I tried grilling pizza tonight on my charcoal grill and it was a hit. Next time I’ll lay the coals flat on one side of the grill so as to have a side to allow the dough to sit after the first flip to slowly melt the cheese. This will also allow me to stay in control of the heat. Keep the pizza size small so it’s easy to work with. My husband loved it and even my four year old ate it up! All through two steamy thunderstorms in NH!